We used iPhotoBooth over the weekend for a birthday party and it was fantastic! Kaity was very accommodating, helping us to get the right balance between clarify and height of the camera. Took a little doing, but she was very gracious and helpful to our taller guests! Everyone had fun, including all the people who helped us pull off a great party, and we couldn't be happier. Every guest got a copy of all the pictures they were in, and could also view all the evening's photos on line. Lillian did a great job with the text for the photo strips and Rachel and her husband were very helpful customizing our event. We couldn't have asked for more and will certainly use them again! Oh, and did I mention, we received a discount as well! Win-Win!! IPhotoBoothJax was such a fun added touch to our wedding. The photos were so fun and professional looking. I loved the logo at the bottom of the strip that Lillian put together. It was amazing. The guest book was incredible with the photos and notes added next to the pictures. What a treasure. Walker was amazing to work with from beginning to end. I would definitely hire them again for another event and highly recommend them to anyone looking for a photobooth. Iphotobooth did our photobooth for my wedding and they were great to work with. I would use them again in a heartbeat! iPhotobooth Jax was wonderful to work with and was very flexible with our needs and requests. They were prompt and very responsive and provided a great service that all of our guests enjoyed! Awesome addition to my wedding! Great quality and everyone loved taking a keepsake from out big day. iPhotoBooth was a great company to work with for our wedding. They were responsive, flexible and provided us with a great custom logo for our pictures. At the party, the attendant was fun and totally on top of getting everyone their photos. Couldn't be happier with our decision! First of this Company provides the best Customer Service. On time, Friendly, Responsible, Creative and very Reliable there is nothing wrong I can say about this team. This will be the perfect addition for your party or activity at a very good price. OH MY GOODNESS! SOOO MUCH FUN!!! Fun for our guests & fun wedding memories to look back on in our guest book -- the photobooth prints are nothing short of AMAZING! We are beyond thankful to have these memories captured and are so glad we went with the photobooth guestbook! The attendant was professional, fun, and interacted well with all of our guests helping to pass props, guiding them to sign the book, and printing extras when desired! We loved that we could set it up outside with open air by the dance floor and it was the perfect place for everyone to let loose and be a little silly capturing such a fun night -- THANK YOU x FOREVER! iPhoto was very professional and timely. The attendant helped to ensure all the guests had time in the photobooth and it was a huge hit at the event. You can even add your own design to the bottom of the photo strip. Will absolutely use them again! The background was a classy gold and not cheap looking like other photobooths and it was perfect that it was open air so as many people could join in the photo as possible. Walker and his team provided me with customized service for my wedding day. I asked for specific things to coordinate with my wedding colors and they were able to accomodate those requests. They designed a beautiful photo strip that matched with my theme and were just all around great to work with. I would highly recommend this vendor to anyone who would like to add a special touch to your event! iPhotoBooth was amazing! They had great staff, a huge range of props and we got a book filled with messages and photos from all the people at our wedding which is so nice to have and read through! I recommend that everyone use iPhotobooth for any event! You will not be disappointed! Our guests are still talking about the Photo Booth! I'm so happy we had iPhoto booth at my wedding! It was a huge hit and everyone loved it! Pictures were awesome and so much fun. My sister is also getting married in November and we are definitely using iPhoto booth again. If you are thinking about having iPhoto booth at your wedding, I promise you will not regret it!! Trust me, you need iPhoto booth at your wedding! Do it! iPhoto booth was awesome, a big hit at the wedding. Everyone loved it! These guys were a huge hit; our guests couldn't get enough and waited in line for their turn. My husband and I were shocked that we were able to take an album home with us that night and loved thumbing through the next day, seeing guests we didn't get to visit with having a blast at our reception. Thanks iphotobooth for capturing moments no one else did that night and for bringing such excitement to the crowd! We absolutely LOVED iPhotoBooth. Everyone we worked with was very helpful, responsive, and provided excellent service. Aston ran the photo booth at our event and he was amazing. Very personable and a pleasure to have running the booth. 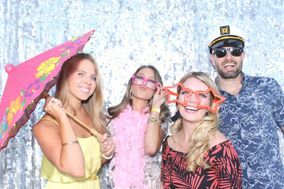 I would recommend using a photo booth for any event, and iPhotoBooth in particular in the Jacksonville area! The photobooth was a huge hit at our wedding. The attendant, Nick, was so personable and really added to the overall time! Thanks for helping make our wedding extra awesome! We hired iPhotobooth for our wedding in February and couldnt have been more pleased with our experience. We had so many people come up to us and tell us that it was the best Photobooth they have ever seen. From every prop, to the set up (they added a gold backdrop as a surprise since my colors were gold and white which they didnt have to do!) to the attendant, it was out of this world fun. The owner, Walker Day, went above and beyond to make sure I had everything I wanted. They also have a graphic designer on staff who worked closely with me on the design for the photo strip. This, by far, made our wedding so much fun! I would HIGHLY recommend them for weddings, birthday parties, anniversaries, work celebrations. You can never go wrong with having a photobooth at your function! They showed up early and were set up and ready to go! Their staff were very professional and the quality of the pictures are AMAZING!! Our guests loves the props and our guest book is one the remember. They were very easy to communicate with during the planning process and we cannot wait to use them again! I can't wait to use this company again for future parties. They were so professional and helpful and genuinely nice to work with! Walker Day was very easy to get ahold of and made sure everything was perfect. Our graphic/logo on the photo strip was so cute and perfect! We loved having them and using this as our guest book was the best idea ever! Thank you for everything! I was very happy with the photo booth and my guests as well !!! Great service. Great responsiveness. Awesome flexibility. Walker and his team are awesome. The photo booth was a hit . We had to add an extra hour at our wedding because everyone was having so much fun taking silly pictures. Great service! Iphotobooth and Walker did an amazing job at one of the weddings I coordinated. WOULD RECOMMEND AGAIN AND AGAIN!